Emptyseat88. For those of you who don't know, this is the online account used by Scott Fischman of the "Crew" fame. This is not a player that you want to get involved in big pots with. Emptyseat88, aka Scott Fischman, doesn't put in the same volume of tournaments as someone like Annette_15 or Busto_Soon, however when he does play, he uses finishes very high. Fischman is another of the super-aggressive, will call my entire stack off if I believe my read is right type of players. Conservative is just not a word that is in Fischman's vocabulary. Because of this super-aggressive play, you can sometimes see Fischman go from being a leading stack in a tournament to gone in 2 hands. He is just that type of player, but because of that, he puts himself in positions to win often. If you look up Emptyseat88 in thepokerdb.com, you will see that he has a bunch of $10,000+ scores so far in 2007. I would say that if emptyseat88 decided to play the same volume of tournaments as someone like annette_15, he would be one of the top-ranked online players in no time. 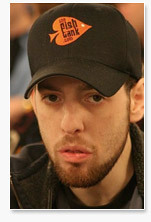 If you are interested in seeing Fischman play live, your best chance to see him is at the World Series of Poker coming up in June. The way he is playing, I wouldn't be surprised to see Fischman take down a bracelet this year.